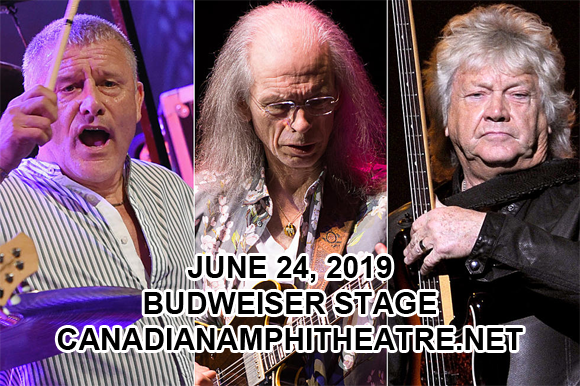 The kings of British prog rock are headed to Budweiser Stage on Monday 24th June 2019 for The Royal Affair Tour, featuring Yes, Asia, John Lodge & Carl Palmer's ELP Legacy! The event will see sets that honor the musical legacy of the bands, as well as paying tribute to icons such as Yes members Chris Squire and Peter Banks, Asia founder John Wetton, The Moody Blues' Ray Thomas and Emerson, Lake and Palmer's Keith Emerson and Greg Lake. Yes' Steve Howe says: "Yes is delighted to headline this celebration of British music which has been so warmly received in America over the past five decades." Yes drummer, Alan White adds: "I'm looking forward to joining a number of classic British talents that have delighted so many fans over the past half century." Asia keyboardist Geoff Downes states: "This is a unique celebration of the British contribution to classic rock over many decades. It will be inspirational to be a part of. And I know it is what John Wetton would have wanted." An enduring and pioneering voice in progressive rock, Yes are an English band that formed in London in 1968. The group has lived through a variety of line-up changes and also changes in musical direction over the years and, as of 2015, consists of guitarist Steve Howe, drummer Alan White, keyboardist Geoff Downes, singer Jon Davison, and bassist Billy Sherwood. Best known for their U.S. number-one single "Owner of a Lonely Heart", from their eleventh studio album 90125 (1983), the band earned the Grammy Award for Best Rock Instrumental Performance in 1985 with "Cinema", and received five Grammy nominations between 1985 and 1992. The band was inducted into the Rock and Roll Hall of Fame in April 2017 and has sold 13.5 million RIAA-certified albums in the US to date.